The index manages to retake the 96.00 handle and above. Yields of the US 10-year note stay depressed near 2.52%. Philly Fed index surprised to the upside in March. The US Dollar Index (DXY), which gauges the greenback vs. a basket of its main rivals, continues to recover part of the ground lost on Wednesday further north of the key barrier at 96.00 the figure. After bottoming out in the 95.80/75 band in the wake of the FOMC meeting, the index met some dip-buyers and is now edging higher to the 96.30 region, or fresh daily highs. The greenback stays bid so far today as market participants continue to digest the recent dovish message from the Federal Reserve and on the back of positive results from the US docket. 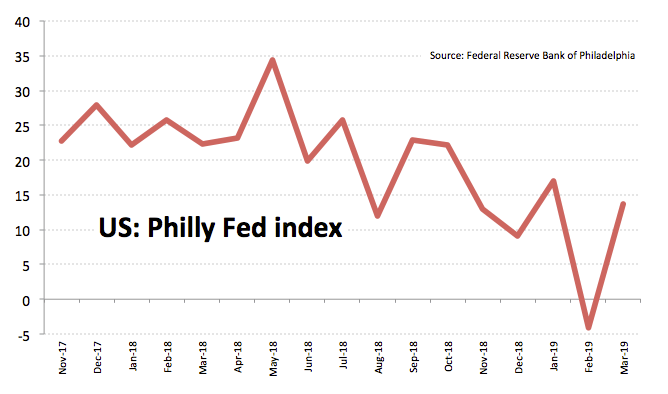 In fact, the buck is deriving extra upside momentum after the Philly Fed manufacturing index came in at 17.3 for the month of March, surpassing prior surveys and reverting February’s -4.1 print. Additionally, Initial Claims rose by 221K inter-week, also above expectations and taking the 4-Week Average to 225.00K from 224.00K. The index is expected to trade under extra downside pressure in the next hours while investors adjust their views to the renewed dovish stance from the Fed. In light of the heightened patient stance from the Fed, traders will now scrutinize every piece of incoming data, particularly regarding the inflation performance. Fresh jitters from the US-China trade front could, however, put a floor to the buck’s decline in the near/medium term. At the moment, the pair is advancing 0.28% at 96.20 facing the next hurdle at 96.32 (55-day SMA) seconded by 96.58 (21-day SMA) and finally 97.37 (high Feb.15). On the flip side, a break below 95.84 (200-day SMA) would open the door to74 95.89 (low Mar.20) and then 95.16 (low Jan.31).